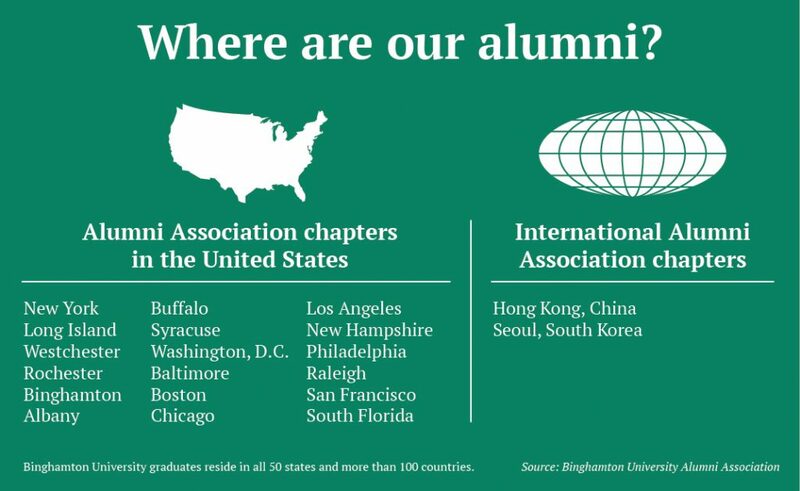 Over the past several years, Binghamton University’s alumni base has been maintaining its Bearcat heritage in various metropolitan areas like Buffalo and New York City. With the University’s support, these areas have become centers for alumni groups across the nation and globe, conducting numerous events and meet-ups to engage with and expand their graduate populations. The Binghamton University Alumni Association, established in 1951, is the primary network for University alumni. According to Kim Faber, executive director of alumni engagement, the association organizes alumni into 18 regional chapters nationwide with an additional two chapters outside of the country in Seoul and Hong Kong. The association also helps alumni connect with one another through affinity groups, which enables graduates who feel a strong affiliation to a career field or student organization to form an identity as an alumni group. In total, the University has approximately 130,900 living alumni, including 6,100 graduates living internationally. Christina Ritter, ‘99, the chair of the Alumni Association’s Washington D.C. chapter and member of the Binghamton University Alumni Board of Directors, said she works closely with alumni engagement staff to plan events, increase engagement and expand the regional chapter network. Much like the D.C. chapter, the Chicago chapter hosts numerous social and networking events to engage with its approximately 700 members. The chapter’s leader, Francesca Bullerman, ‘04, a faculty assistant at Northwestern University’s law school, said maintaining connections to BU could help with the challenges of moving to a new area. According to Natalie Murphy, ‘14, the chapter leader for the Buffalo area, the University’s support is critical in helping chapter leaders coordinate alumni events. Last winter, Murphy relaunched the Buffalo chapter with a tour of New Era Field, the home of the Buffalo Bills. Murphy was able to do this through a professional connection with David Wheat, ‘94, the chief operating officer for the NFL team. Working with the Fleishman Center for Career and Professional Development, the Alumni Association also connects alumni with students, allowing alumni to network with students and share their experiences in their respective fields. In his quarterly report, President Stenger mentioned alumni groups and their importance in serving as advocates and mentors to current students. Stenger attended several events in California and Washington where he informed alumni of the future initiatives and projects the University will undertake. Outside of the Alumni Association, many alumni attend University sports events, host networking and career development talks and meet on weekends with one another. Jeremy Zylbert, ‘14, a social studies teacher at Oceanside High School in Oceanside, New York, hasn’t attended an official alumni meetup, but regularly sees his friends. Ritter said her involvement in alumni circles has helped her stay connected with BU, network professionally and form friendships with other alumni.